Crate Style 1/2 Inch Bare Wood Supply Trunk Case - Kit Form - Inside Dimensions 21 X 10 X 11 7/8 High by Roadie Products, Inc. at Right Clearing. Hurry! Limited time offer. Offer valid only while supplies last. Please make sure you measure your plasma including stands, clamps, brackets, etc and compare to the inside dimensions of this case before purchasing. Please make sure you measure your plasma including stands, clamps, brackets, etc and compare to the inside dimensions of this case before purchasing. These large plasma cases are very expensive to ship. Returning this case will not be cost effective to you. 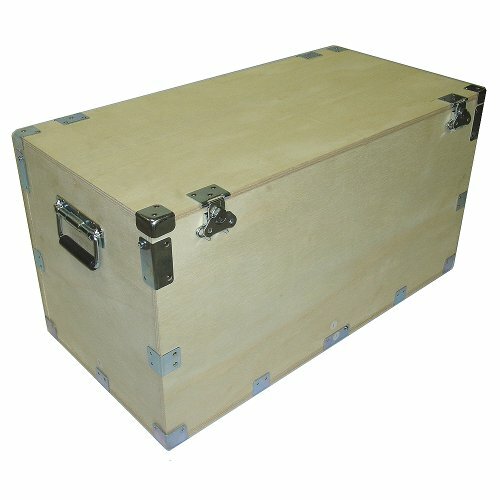 This unique designed case is manufactured with 1/2 Inch plywood construction. Assembly is required as this case is shipped flat. Easy-to-follow pictorial instructions are included for easy assembly. All holes are pre-drilled. This case has a bare wood interior but offers strong and sturdy protection at an economical price. This case does not include interior foam protection or foam sheets.